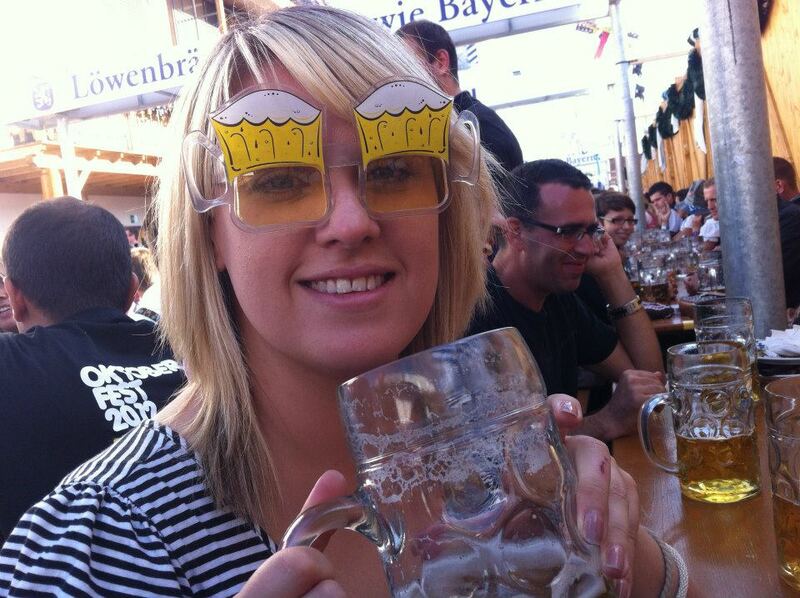 Missed Oktoberfest 2013? Try for 2014! | Information...Super, Flyaway! 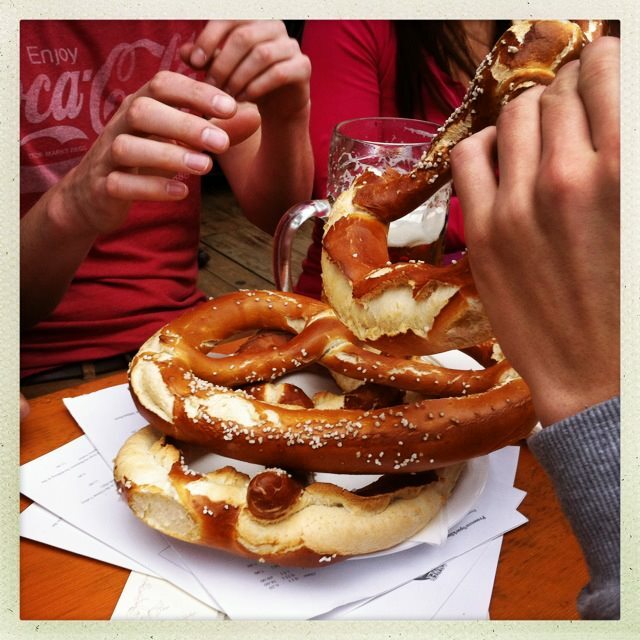 Missed Oktoberfest 2013? Try for 2014! 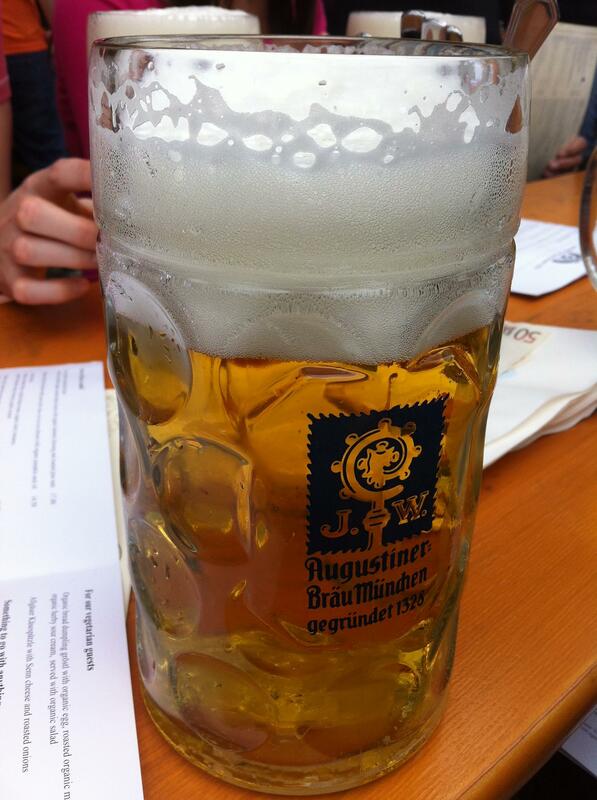 Most of my travels involve some kind of cultural appreciation but I must admit that there has been one particular trip organised with the single objective of drinking alcohol – Oktoberfest in Munich, Germany. I realise October has almost finished but this is actually the perfect time to contemplate your trip for next year. Hotels get booked up as early as February for the festival, which starts (despite the name) in late September and runs for two weeks (in 2014 it will run from 20th September to 5th October). The festival was originally started in the 1800s and consisted of horse racing and beer drinking. Over the years the beer drinking remained and the horses were replaced by fairground rides – hundreds of them! This playground surrounds up to 14 huge tents that are home to each of the largest Munich breweries. When I say tent, don’t imagine a small marquee – oh no. Each tent is a huge structure that can house around 10,000 people each, sat on benches in long rows. 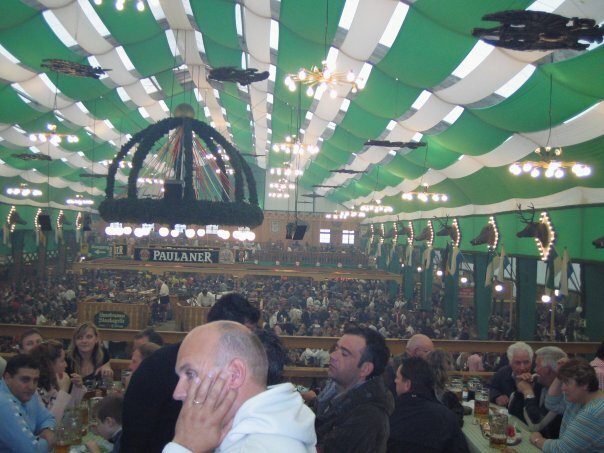 Some tents are traditional and some are more modern, all serving different food options and, of course, beer. 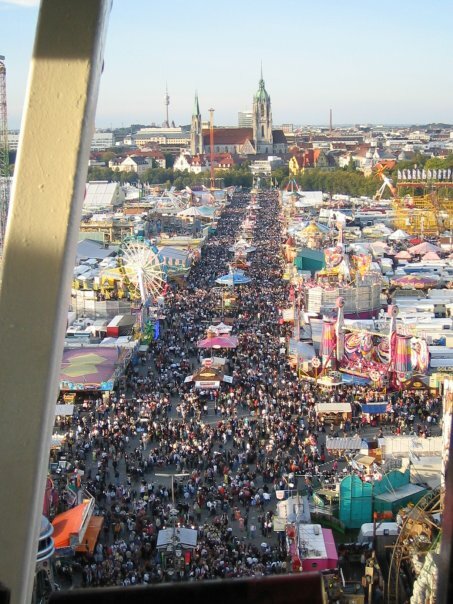 I have been lucky enough to go to Oktoberfest in Munich twice – in 2007 and 2012 – both times to celebrate the ‘coming of age’ of a family member. 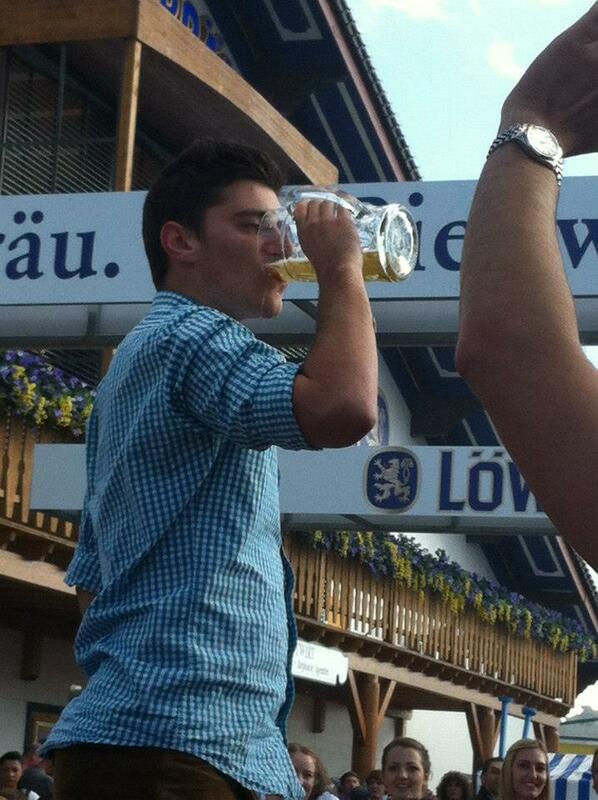 My lucky (or unfortunate) step-cousins saw in both of their 18th birthdays under the influence of German beer. My Dad and Step-mum came on both trips, along with my sister, friends and boyfriend – so the age range was varied, but we all had an amazing experience. 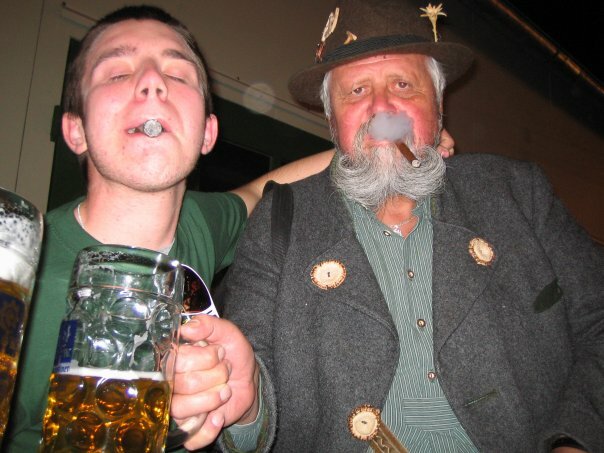 I believe the British way of drinking (binge-style, followed by vomiting and fighting) has ruined our impressions of such alcohol-related events – in fact, I have never seen violence at Oktoberfest and most people are incredibly well behaved. 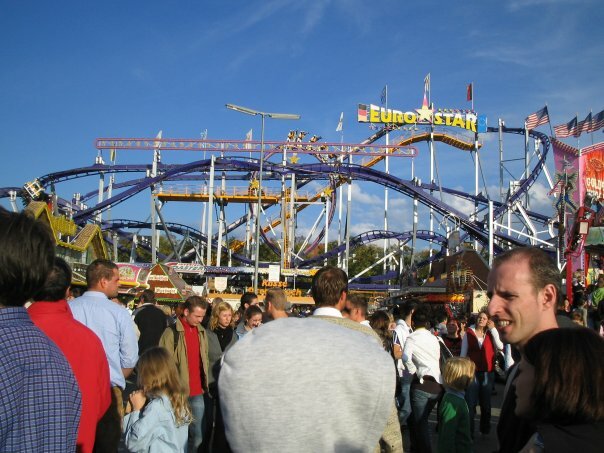 It really is a family event, with kids and adults alike on the fairground rides and everyone wearing Bavarian hats. 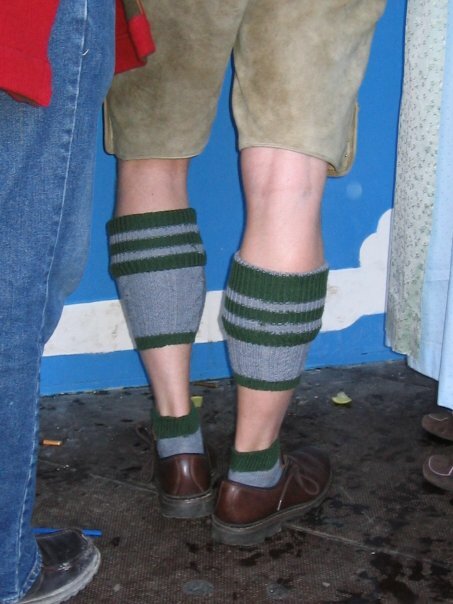 And it’s not just a tourist trap, the locals are fully involved and come out in droves, wearing their traditional Bavarian outfits, some of which are questionable in taste! You will also see many elaborate moustaches! Now one thing you may not know is that seats in the beer tents are booked in advance and to walk into a tent and get a seat is very rare (unless you are there from first thing in the morning and don’t move all day!). 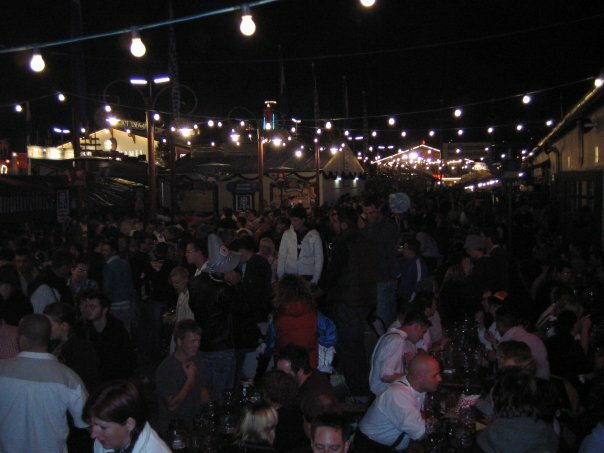 Both times we decided not to book in advance and instead we found seats available in the beer gardens – which are specially designated areas outside of the tents, a bit like pub gardens. The atmosphere in these gardens is just as animated as inside and we ended up squeezed into benches with lovely people from all over the world! You don’t usually have to wait for long and people squeeze to make room for you. 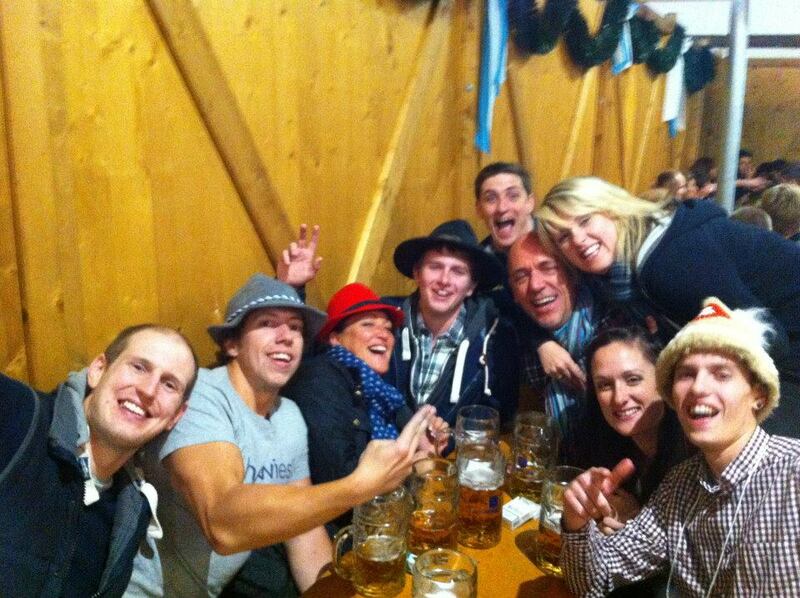 People at Oktoberfest tend to talk to you, even if they don’t speak your language! On the first trip of ours we were clapping along to traditional bands with local German people and dancing in the aisles with some Swedish men. On the second trip we started in-depth discussions about beer with some Israelis and laughed at some young French men trying to down their steins! 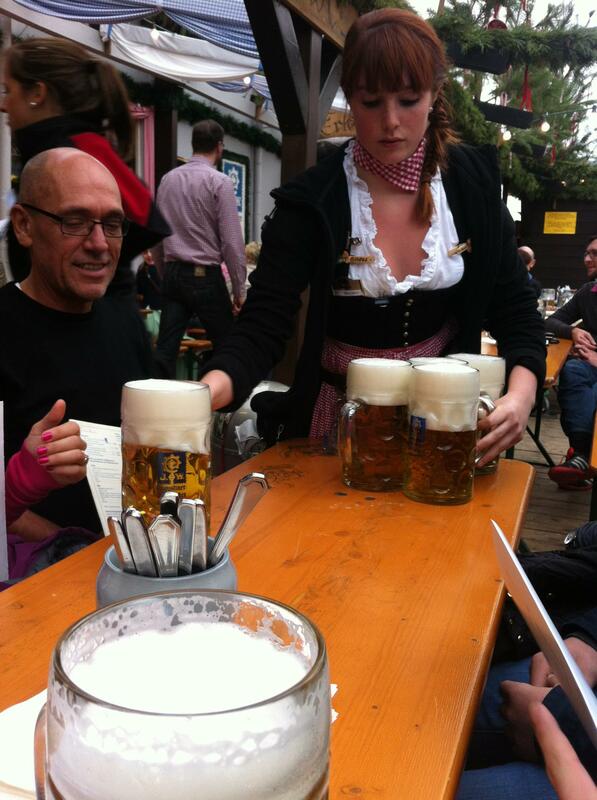 Be warned – if you stand on your chair and state that you will down your entire stein, you must be confident that you will do it – you will be booed by the crowd (in a friendly, but very loud way!) if you do not succeed! 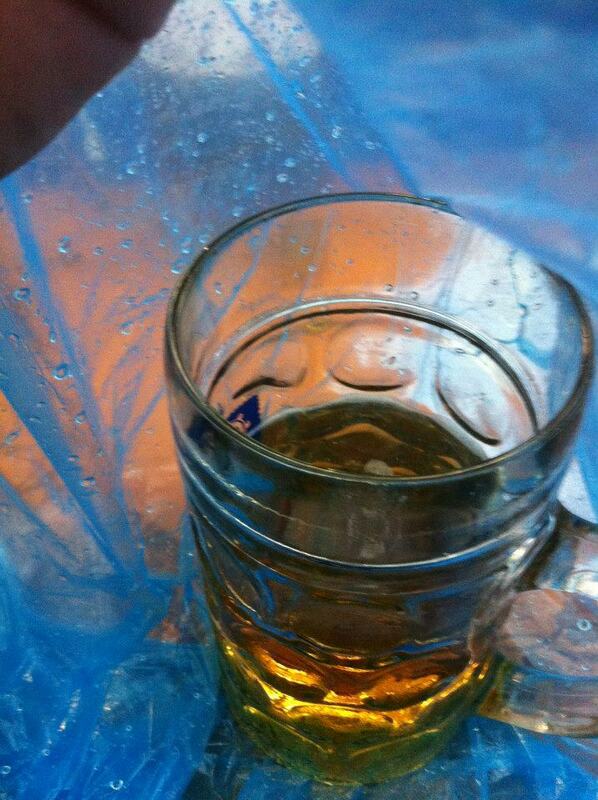 So there are plenty of benefits to being out in the beer gardens but there is one down side – rain! 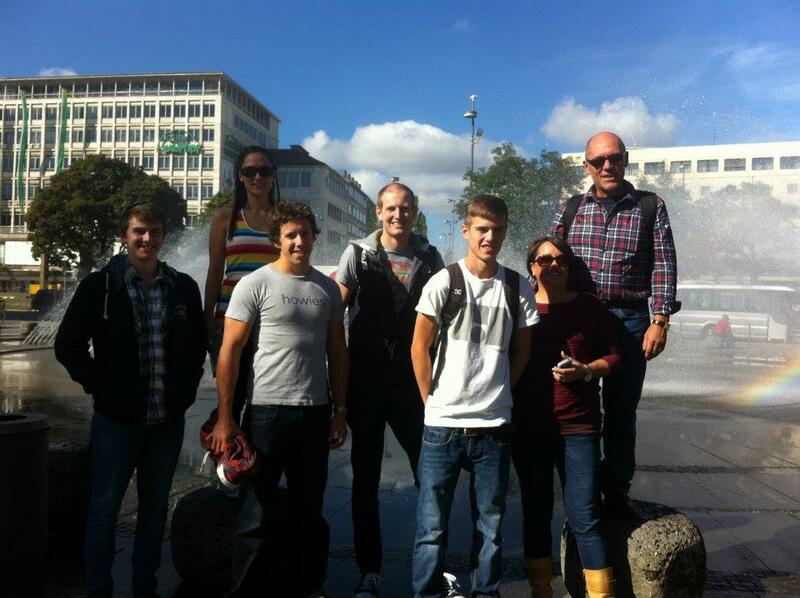 The weather in Munich in September is actually pretty nice, with plenty of sun and cool, mild days. But you may hit the odd spot of rain. When that spot hits, try to make the best of it! 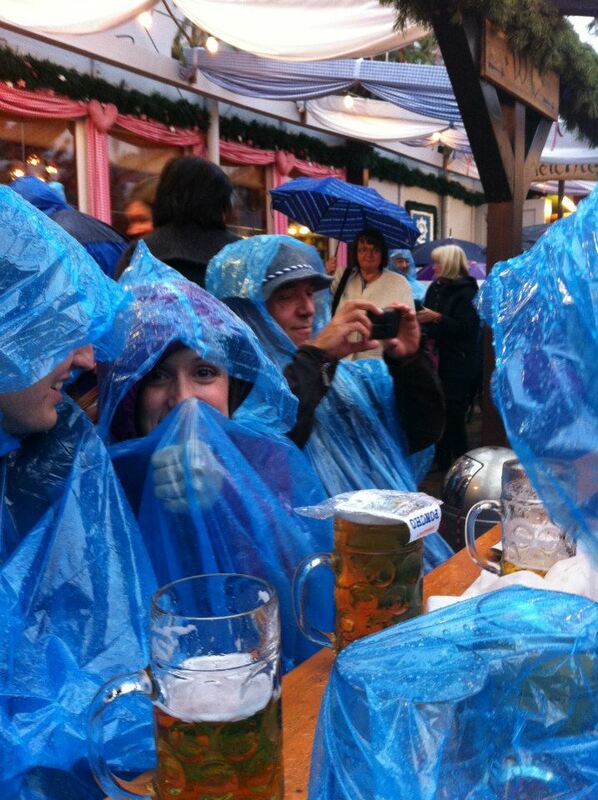 We bought ponchos from a seller and were determined to stick it out – moving our beers under cover so the rain wouldn’t dilute the beer! 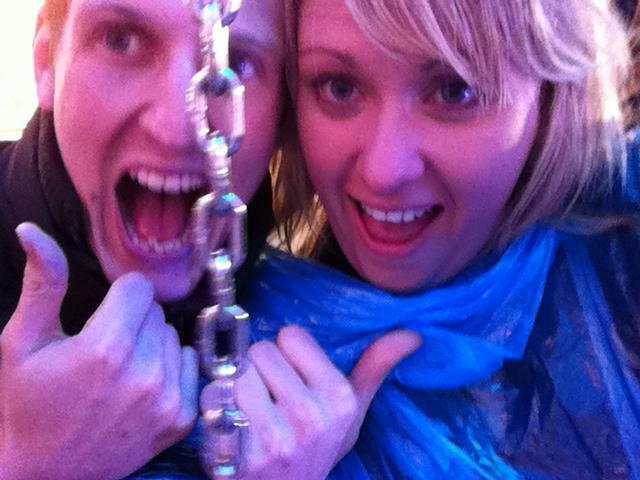 When the rain cleared and the beer was sitting well, we went out into the fair and took on a few of the rides. Our favourite was the carousel with chain swing seats. 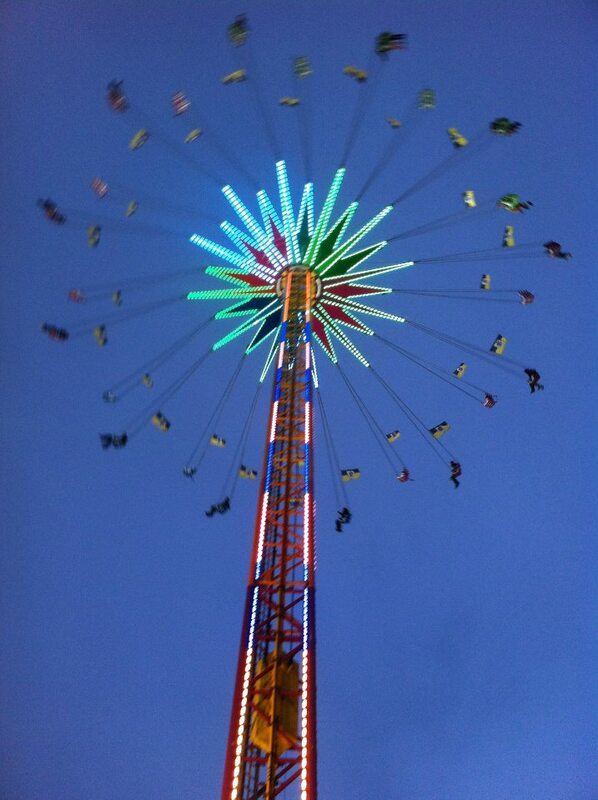 The one from our childhoods was only 15-20 feet off the ground – this one was more like 200! 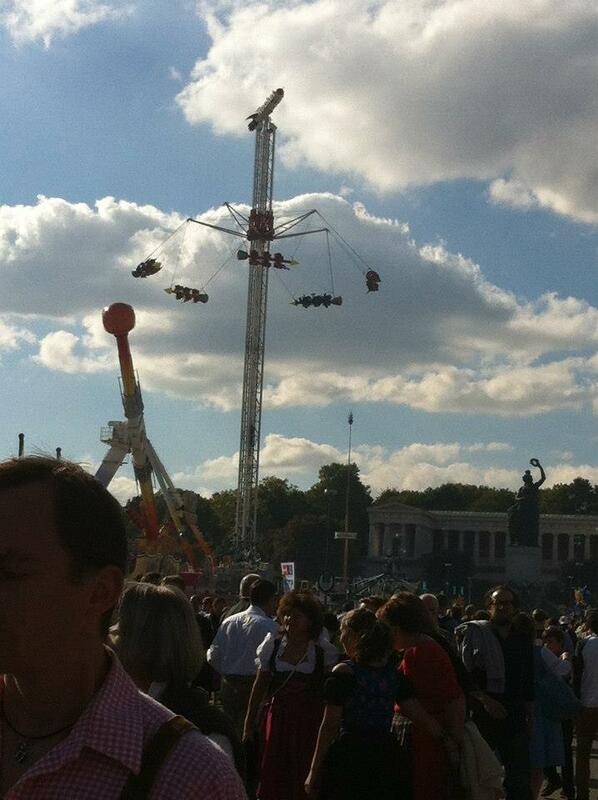 I love the memory of seeing my Dad and sister swinging around in the air, waving their arms with no regard for safety! 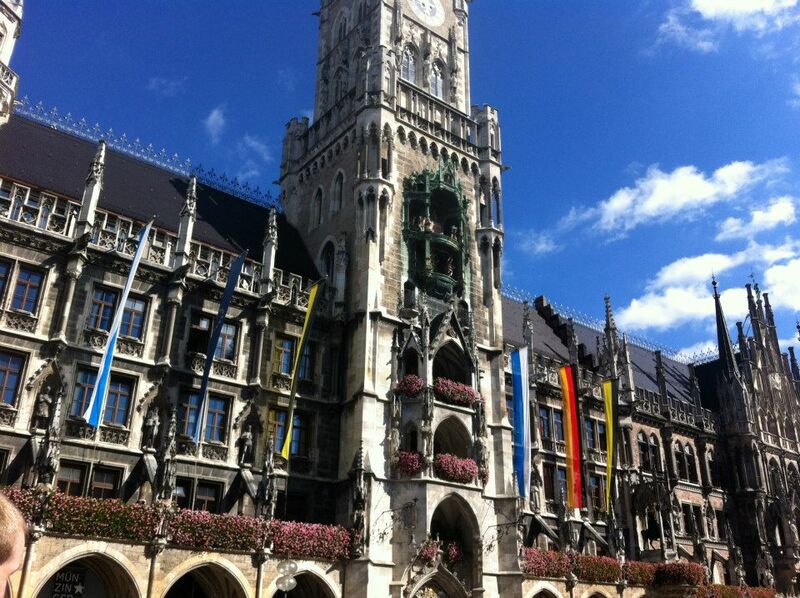 Don’t get me wrong, it’s not all about drinking alcohol – during the day, once you’ve recovered from your hangover, you can head out into Munich and enjoy the sights. 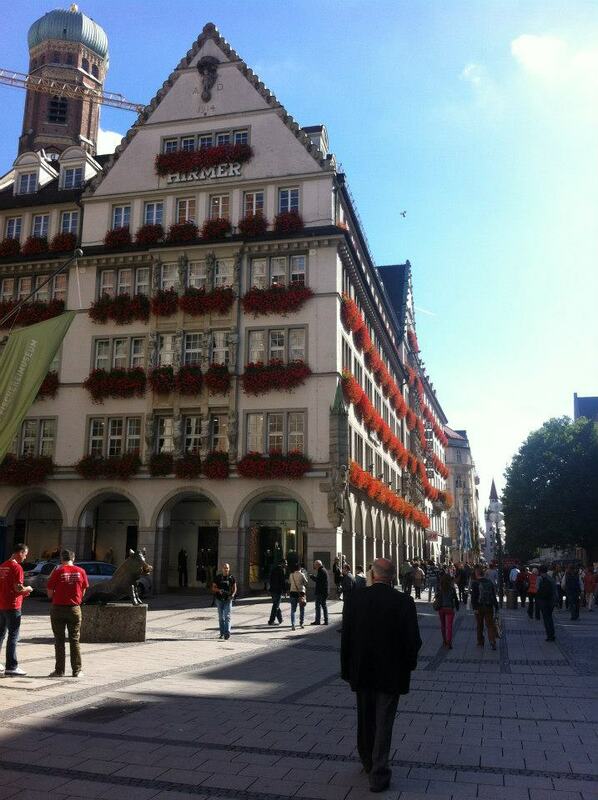 The traditional Bavarian architecture is beautiful and many of the buildings are adorned with hundreds of flowers. There are street markets, performers, and hundreds of pavement cafes and restaurants where you can people watch for hours. 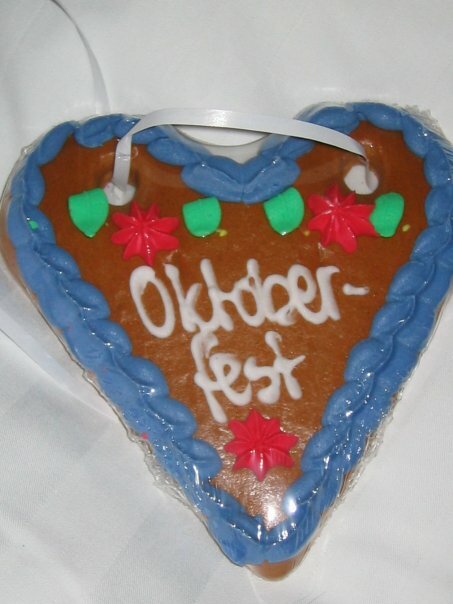 Are you game for Oktoberfest? 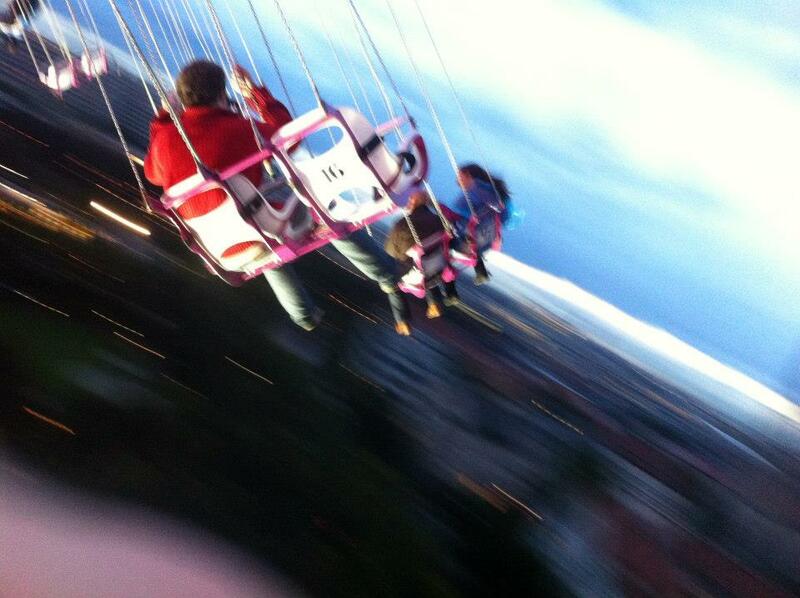 Think you can take on the carousel swing? * Your liver may regret it!